Although I anticipated the answer, I needed to find a chart graphing historical events against the stock market. As you would imagine, the more severe the news – the more the market plummeted. Back to 2009 – equities were at fire-sale prices, yet my urge to grab everything under the sun was relatively low. My wish list grew daily, but my executed orders were close to nill. Simply put, my brain was outputting conflicting messages. How could this be given I knew the Buffet adage, “Be fearful when others are greedy, be greedy when others are fearful”. Finally, greed can be prevalent at all times. It would take a lot of convincing to have me believe people during The Great Depression weren’t greedy. Instead of stock returns their focus shifted to food rations or jobs – but the greed was still there. The transformation that occurred was with their expectations. So why is this important? Because greed can be too hard to measure, but expectations are a PERSONAL reflection. This is why you have two sides being argued now. “Perma-bear” and “perma-bull” analysts are debating their skewed personal scales against the same market conditions. The bulls fear less and expect more while the bears are fearing more and expecting less. And there it is – the differences between expected risks & rewards fuel each other. 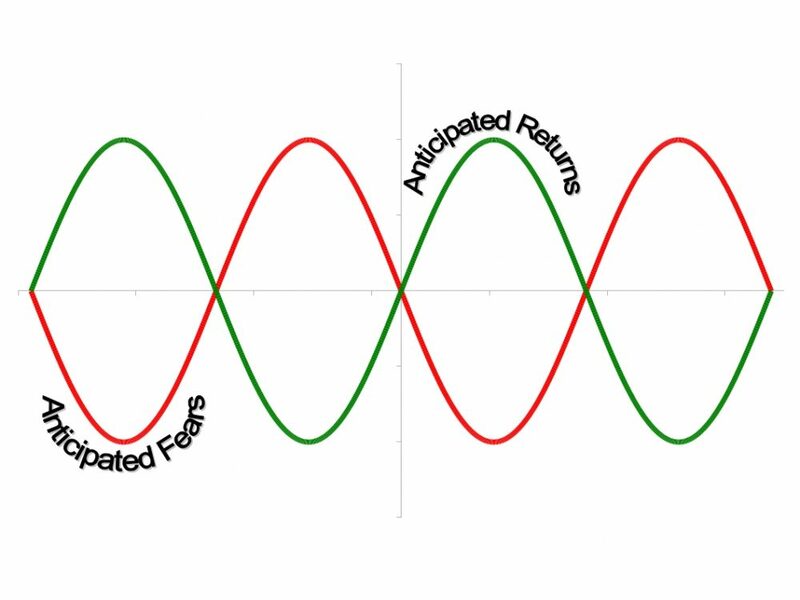 As the chart below shows, the higher your anticipated fears the lower your anticipated returns and vice versa – just like the timeline highlighted. There are numerous examples we could look at to illustrate how this plays out, but we’ll take employment for now. Being fearless lead to greater expectations. When unemployment was low, people had no concern for losing their job. With everyone employed, the expectation was for inflation-adjusted performance reviews at a bare minimum. Not receiving a raise was considered a slap in the face and would easily prompt someone to leave for elsewhere. Being fearful lead to lower expectations. With unemployment still teetering in the double-digits, now people have changed their tune. They’re just happy to be employed, and may not be expecting that annual raise. Still working out how exactly you’d apply this to your own life, but here’s what I’ve got for now. I really like that, “being fearless leads to GREATER expectations.” I agree. Now that it’s a rocking bull market, let’s shoot for even higher goals! .-= Financial Samurai´s last blog ..The Good Times Are Back Again – The Indulgent List Of Things =-. .-= Money Reasons´s last blog ..MoneyReasons Weekly Cache 2010, April 18 =-. Good deal increasing your limits. While we don’t have a crystal ball that show which way the markets are going – there are known variables we can control: increase contributions, decrease fees, limit taxes, etc. After you have seen enough cycles you learn to sell when the market is high and buy when it crashes. I may be in early and out early but I am ahead of buy and hold. .-= Daddy Paul´s last blog ..The best taxable bond mutual funds =-. That’s a very interesting comment. Simply catching the peaks would be near impossible. But purchasing while its still at a discount and selling while its still on the rise would give you a nice return. Do you use specific breakpoints (volume or %s) for entry/exit points? I think much of this world runs on fear and we all know that banks and government use fear as a tool to control certain behavior’s of the public at large. …I really like your analogies here. As for investing as a whole. I have always been fearful not matter how the market is going. I hope to get over that one day. .-= Forest´s last blog ..Using Tomato Ends For Your Spaghetti Sauce Recipe =-. Agreed that fear is heavily pushed unto the public. I refrain from watching several news channels & specific stories because they focus more on the gasp factor than anything. Also agreed on leaning more towards fear. Not with my own life ironically – broken limbs, surgeries, scars – skydiving, cliff jumping, motorcycles – I can’t seem to get enough, but with money. Like the gambler who gambles into debt, but believes he can gamble his way out? I think the reflecting you’re doing now is very valuable. People edit their history, instead of actually working out what they did and why. They pretend either that they did something they didn’t do, or that the justify it via some flimsy pretext. Eventually that becomes the truth. One thing to look out for with the markets is not to get overwhelmed with economic data. Almost always the economic data looks bad when markets are very low. Almost always it looks great when markets are high. Everyone knows this, but when the time comes people write realms about the economy and how the market can’t go anywhere. Oh but it can. Valuation if stocks and general investor sentiment is much more important than jobs or the trade balance in the short term. Arguably even the long term. “People edit their history” – very insightful. Overwhelming myself was an issue earlier on. It seemed like I did all the research possible, but would never pull the trigger and “miss the boat”. Then would get anxious and make rash (and unprofitable) decisions. I am working on simplifying & streamlining the process. Hah! I must admit that I’m generally such a chicken that I rode that out mostly from the sidelines. I feel even more ‘chicken’ when the markets are doing well, though, so I can imagine myself doing some buying when times are bad for the stock market in the future. . .at some point. .-= Simple in France´s last blog ..Saying “NO” to Fitting in. And weekly post picks. =-. Well. On one hand, there was the incredible upswing. But on the other, you may not have lost the amount of principals others did. There’s always two sides to the equation. How did the car buying go? I will check out your site for a post on it. I’ll admit- I’m a chicken when it comes to the stock market. I’m afraid! I need to get over that quickly, it seems. .-= Mrs. Money´s last blog ..Creating Multiple Income Streams =-. If you can’t shed the fear of the market, then led the fear of inflation/taxes/real returns overwhelm that single fear. Does that make sense? Sometimes it’s not the fear of a particular thing, but the fear of the opposite that can drive us! I’ve always found it easier to be the contrarian. While not foolproof, it has more often than not served me pretty well over the past twenty years. The best example is it saved me from getting caught in the last market crash. Heading into the storm and leaving when things get calm & sunny takes gusto. Thinking about this, makes me wonder what if explorers agreed when others told them it couldn’t be done. Probably since I finished reading an article on Hiram Bingham. If you don’t I will! .-= LeanLifeCoach´s last blog ..Money and Loyalty =-. Alright I’ll ponder it some. Actually, I was just thinking about writing a post on “harnessing your compulsive behaviors” to your advantage.